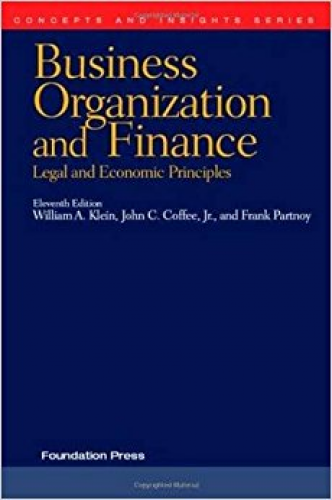 Klein, Coffee, and Partnoy’s Business Organization and Finance, Legal and Economic Principles, 11th explains the basic economic elements and legal principles of business organization and finance. It is the best additional resource to assign to students for background. It distills in a straightforward and accessible way the essential elements of these often complex topics and explains the basic economic elements and legal principles of business organization and finance with concise, conceptual overviews. It contains a detailed introduction outlining the essential functions of corporate law. It contains an invaluable new section covering recent developments in financial markets, the financial crisis, the role of derivatives and financial complexity in the modern corporation to give students background on modern financial issues. An authoritative introduction to the law, the Foundation Press Concepts and Insights Series offers law students concise, conceptual overviews of important areas of law, as written by leading scholars. Students reap the benefit of the authors expert opinions, insight, and experience, with illustrative case studies, case notes, and examples. The paperback texts also contain thought-provoking questions designed to generate classroom discussion and hone students’ legal reasoning.